Hero Histories: The Woman Who Loved Scrooge! When you think of Ebenezer Scrooge, "lovable" is probably the last word you'd associate with him. Yet, one woman gave her heart to him...was engaged to him...and had her heart broken by him! She appears twice in A Christmas Carol, during Scrooge's journey with the Ghost of Christmas Past. First, we see how the young Scrooge choose between his love of money and love of her. Second, we see how, after the breakup, she married a good man and together they raised a loving family, giving Scrooge a look at what "might have been" had he chosen to remain with her! Almost every dramatic adaptation shows the first incident, but omits the second scene (usually due to time constraints), thus many people have never known how Belle's life turned out after Scrooge left her! Most illustrators of the many editions that have been printed over the decades have also bypassed the conclusion of Belle's plotline. The legendary illustrator did not one, but two color illustrations just for the short conclusion to Belle's story in Stave Two! And we at Atomic Kommie Comics™ just had to include both of them in our A Christmas Carol collection! One, Belle & Children shows Scrooge's once-love playing with her kids. 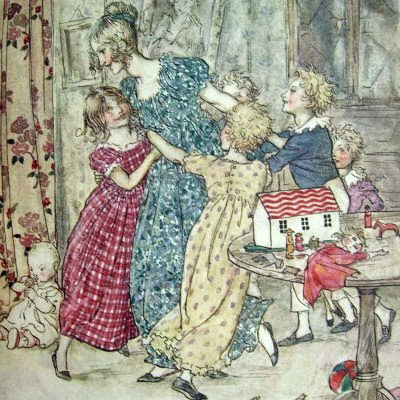 The other, Belle's Family portrays the children crowding around their father as he comes home, laden with presents! They're absolutely beautiful pieces, some of the best work Rackham ever produced!